Pharma Franchise for Oncology Medicine – Medicines are very important for everyone. Nowadays, there is a huge demand for oncology drugs. These anti-cancer medicines use in the treatment for cancer patients. Cancer considered as the most popular and largely occurred disease in India. Stensa Lifesciences is an innovation-driven company and delivers a high-quality range of medicines. At Pharma Franchise for Oncology Medicine, the company offering anti-cancer medicines for cancer patients. The company owns a very good reputation in the market for every medicine segment. Now the company offering business opportunities for those who want to run their business in the Pharmaceutical industry. Joining the pharma industry by Pharma Franchise for Oncology Medicine is a good source for entering in the Pharma sector. This is a good opportunity to start up our own business in the competitive market. The company has business associates PAN India. Collaborating with Stensa Lifesciences for business purpose is a good business deal. In order to avail our services and facilities or interested to know more in detail about the company franchise policies. Feel free to call us at +91-8725010016 and for more queries, mail us at stensalifescience@gmail.com. Our representative will available with the relevant information. Highlights Of Starting Pharma Franchise for Oncology Range? The oncology medicines are in great demand. India has a population of more than 14 lakh and most of the people suffering from cancer and a large number of people ending their lives due to cancer. This is the main reason for heavy demand of anti-cancer medicines. In the Pharma industry, there is a good share intake of oncology medicines. Anti-cancer medicines estimated value of Rs Rs 3, 831 crores. It is tremendously growing at a CAGR of 20 percent annually and expected to grow more, The oncology drugs post the effect of GST has put the medicines in a lower slab which makes them affordable and benefiting. Nowadays, people become more serious and taking proper medication until they eliminate these diseases from its root. Thus, PCD Pharma franchise for oncology medicine is the best way to have a profitable business. Best Quality Products By Stensa Lifesciences In India. Quality of our products plays a crucial role for us. Stensa Lifesciences ensure to provide the exclusive range of high-quality medicines. The quality is maintained at the grassroots level at Stensa Lifesciences. The best vendor in the industry supplies us with the best quality range of raw materials. Our company ensures to provide safe and pure medicines to buyers or effective treatment. Our company is one of the most renowned and trusted names in terms of quality at affordable rates. Apart from this, we have the team of quality assurance team who are exceptionally well in their work and keep the strong check on the quality of products at every level of manufacturing. This makes us one of the trusted names when it comes to top Pharma Franchise company in India. 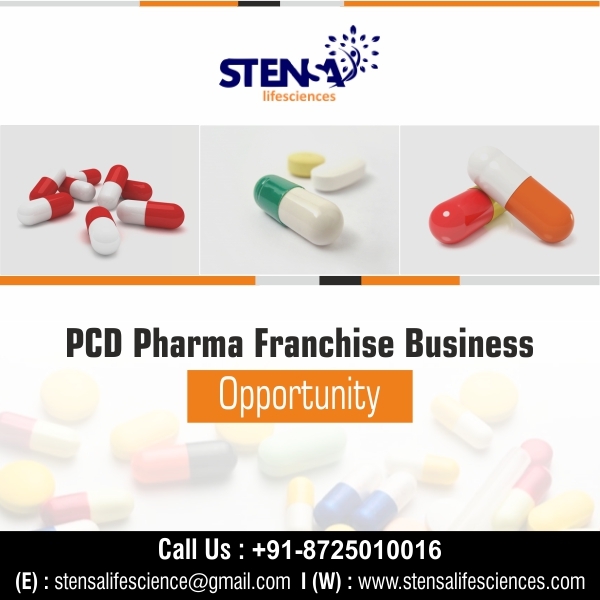 Why Select Stensa Lifesciences for PCD Pharma Franchise Business? Stensa Lifesciences is the most trusted pharma franchise Company in India and therefore. We are having good reach among the people. Being an old player we are responsible for delivering standard products to our customers. If you want to get the success in the industry then associate with us. The company will provide all kind of support and guidance to the franchise partner which will help you in growing your business. Genuine and authentic investment planning. The company is an ISO, GMP&WHO certified. Support from the company 24×7. Timely medical updates and marketing aids will be provided. On-time delivery for all the orders with attractive and moisture free packagings. All the production of the medicines takes place in the excise free zone. Be the part of leading pharma company Stensa Lifesciences and get full support and benefit from our company. This is the chance that you cannot miss. Start your successful business in the pharmaceutical sector by choosing PCD Pharma franchise for Oncology medicine Range from reputed Pharma company. What is the reason for the popularity of the Pharmaceutical Industry? This is usually asked by many people. Franchise business is closely related with the pharma company which ultimately links with the pharmaceutical sector. Nowadays, the government of India is giving much attention to the pharmaceutical industry. The reason behind is its never-ending demand for the medicine and increasing popularity. Also, our company is the world-wide trader that emphasis us to become the leading manufacturer of pharma products. These are the reason for the immense popularity of the pharma industry.